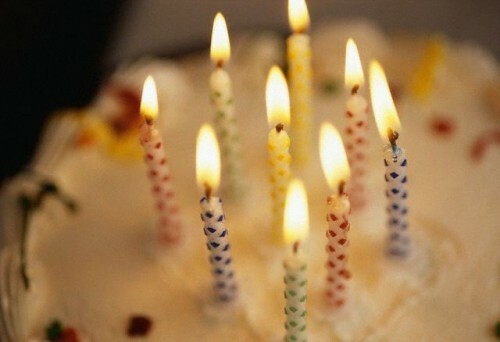 As we grow older, what feelings do birthdays conjure up for you? It’s definitely not the cakes, balloons and blow horns we had when we were children, especially if it falls on a weekday. We still have obligations, meetings, deadlines – the typical daily grind, yet somehow I do not want to miss the blessing of this day. This day that feels like any other captured in a million special moments that I’ll miss if I don’t keep my eyes wide open and ponder them right now. I’m going to savor these next few moments. I’m going to write until my children wake up what ever comes to the top of my mind because I know I’ll forget if I don’t. New wrinkles remind me that those marked lines came from life experiences, mistakes, wisdom, heartache which blossomed joy, emotion – lots of emotion, laughter, anger: wrinkles – all a result of a passionate woman. The scale screams many new pounds this year. The lack of discipline…yes, but in the midst of those pounds I forget what a gift we have in food. The ability to choose our food. The monetary means to buy food. The miracle God has created in our bodies to process and digest food. I have forgotten the multitude of gifts wrapped up in those pounds in my over arching desire to lose them. My Attitude, our attitudes…Choosing Joy. That was one of my tag lines when I first started this blog, and I need that constant reminder. It IS a choice. A daily choice. A choice to embrace. So just in case the children come come down stairs with any kind of bad attitude today, I will remind then that it’s choice. (Now surely they wouldn’t fight, whine, argue or complain on my birthday, would they? Somehow it’s a magical day where all sin is lost, correct? ;)) But just in case they do, Joy is ours for the daily taking. March marks the year anniversary when my hubby’s time of unemployment came to an end. A spontaneous call from a “recommendation” inquiring the contracting services of my husband for just two days to help with their audit led to a job for a month, than a contract for three, and then an offer assuring that they didn’t want to lose him. It was a long year, yet now that a year has passed, I don’t want to forget those feelings of dependence. Those cries to Him to meet our needs. The high fives and screams of joy when he was offered just one month of contract work. Just typing and remembering brings gratitude to the forefront. Employment is a gift. The trampoline that we just replaced is a gift marked by that employment. It’s not a need, but a want. I just searched my archives for that “please remind me” moment, and it’s been nearly two years to the date. That “coincidence” is not lost on me, especially since I don’t believe in coincidences. I am so thankful for being blessed with a want. I don’t take that for granted. Somewhere this year, my boys became men. All three of them. Our girls are all still smaller than me, but my guys…this year marked their movement. They all passed up their mommy (and their daddy, their grandpas and everyone else in our extended family.) With that movement, more challenges knock on the door. Such a pivotal time in their emotional and spiritual lives, yet most people only see the physical movement, their abilities. I see the heart. I beckon for their heart. I pray that their heart is wooed by Him and only Him. For me, this birthday marks another year I have with my children during these pivotal years. It marks mistakes I’ve made as a mom, yet the blessing to nurture for another year. A year can’t be taken for granted. A year wrapped into our family heritage. A year that reveals legacy. A year where intentionality with our family choices need to be sharpened because these years are flying. I smell my coffee and its lingering scent this morning as it met me in bed, brewed by my sweet husband.What a gift I have in him. My soul mate, the father of our five children, my best friend, yet in the daily grind, I can take his daily devotion and love for granted. He completes me. He balances me. He loves me unconditionally. On this birthday, My Savior’s grace, love and gift of salvation ranks number one, but here on earth – there’s no greater blessing than my hubby. Now since I’ve been all introspective on you these last few moments, this birthday marks an extreme gratitude of you – my blog readers. Thank you for joining with me on this journey of balancing beauty and bedlam. Thanks for joining in the conversation in the comments and giving your opinions. Thank you for not expecting perfection, and realizing that this blog, written by a really busy lady, won’t ever be that ideal blog magazine that you see elsewhere. Sometimes I wonder if I should continue chronicling, and it seems like on those days, when I feel like walking away, I receive a little note on how someone’s family finances have been impacted because of sharing our lifestyle. It makes it all worth it. This separate on-line life is quite surreal, and so many of my real life friends and family just don’t get it. I am pretty sure they snicker behind my back and call you my “fake friends,” but that’s ok, I would have done the same thing a few years ago. I have been fortunate to forge some really special friendships because of this blog. Many, I have now met in real life, and the identifying factor with social media, is that once you meet in real life, there’s no time needed to get deep because we’ve already gone there…on here. I love going deep. I am not one for the superficial. You all are a special part of my life and I thank you for reading. It’s another year, and what a year it’s been. I’m closing out this unedited post, so don’t mind any spelling errors, and spending a little more time pondering with my kids the gifts we’ve been given, and how we are stewarding them. Then I might go make some chocolate chip cookies and french fries (my two favorites) and embrace the gift of those few extra pounds…because tomorrow it’s a DIE-T (or not. ;)). Happy Birthday Jen…I hope you have a wonderful day!! I love how you share your heart in so many of your posts, and I love the gentle reminders about savoring life – especially with our family. You remind us how quickly our kids grow up! A very nice post on your special day…and no editing…even better…”ya done good” ha! Keep on chronicling, I so enjoy your blog! Happy Birthday! Thank you for sharing this journey with us. Your faith and the way you tackled your difficulties are an inspiration to me. Happy birthday, tra la la! Happy Birthday. Such a wonderully, beautifully written post. Absolutely raw and hearfelt. Thank you for sharing and reminding us that our years are not to be taken for granted..It’s in those ‘years’ that the memories have been made. Wishing for you a bee-utiful birthday to match your bee-utiful heart! Your blog is a blessing to me and to all of us. Your husband and children are lucky to have you! Happy, happy birthday! Beautiful sentiments and a reminder for all of us to be thankful for our many blessings. Happy Birthday!! Since recently finding your blog and becoming a follower, I GET you. I am also one who goes deep. I find the superficial a waste of time. I can’t tell you how refreshing your blog is. You are someone I would love to have as my next door neighbor. Our household is following the same guidelines yours does. Actually, we just finished Dave Ramsey’s Financial Peace University. My husband is finally on the same “page” I’m on. We are changing our family tree. Thank God! Keep blogging, and fight the good fight. I screwed up something with my name in the last post. Hopefully two times is indeed the charm. Happy Birthday, Jen!!! Thank you for giving us, your readers a gift on your birthday. I so appreciate your faith in our Lord, your enthusiasm, your insights and your smile. You brighten my day and I always look forward to your post. May this be another wonderful year for you and your dear family!!! Hope you’re having a GREAT birthday! And remember, calories don’t count on your birthday! I enjoyed your post greatly. I too have a wonderful son whose heart I am praying for. Any posts you would be able to share regarding teenage boys and how to help and support their most precious heart would be so appreciated. Sweet Birthday Blessings Jen – I love your introspective posts and I love the heart for the Lord and for your family you so openly share with us, your ‘fake’ friends! Go deep as often as you like – it’s your blog and God will use it to bless whom He chooses to bless if you just remain faithful, humble and intentional. Please keep on choosing joy and spreading it liberally through all of the ups and downs of this day to day journey of service to our King. We all need to be reminded to believe God’s faithfulness in our hearts and enjoy the reflection of His goodness in our countenance. That’s my definition of true beauty – no worries of extra pounds or wrinkles here – the true test is simple – is your joy in the Lord showing? You are one special person, thank you for sharing SO MUCH with us blog readers…..you are truly an inspiration. Happy Birthday Jen!! Very sweet post! Life flies by doesn’t it? It’s so important we savor the moments….. Happy Birthday! I hope it was as fabulous as your blog :). Thank you for the inspiration, encouragement, and even money saving tips you provide us all! Today’s post was beautiful. I just wanted to say how much I enjoy your blog. I have been reading your blog for about a year and have learned so much from you. As our family experienced a 7 month stretch of unemployment, your blog brought me so much wisdom, strength, and courage. My husband began his new job in January. That time brought us closer together as a family and also brought a new and deeper appreciation for all we have. I followed your links to read avidly about your experience with unemployment. . . my husband was laid off 14 months ago. It’s been so hard even though, like you, we had been living below our means for so long that not a lot changed. Wasn’t a lot to trim out of the budget, you know? But I’m so tired of this period. Sometimes I can thank God for it, but sometimes I am just weary. Thank you for sharing – it’s heartening. I know all about that weariness, Margo. I wish I had some magic words to help you through it but I clung to the fact that the Lord was the same, yesterday, today and forever and knowing that kept my eyes looking straight on. Sometimes I would feel myself slipping into that little bit of despondency and I realized that was the worst thing to do because it’s too easy to stay there and let it affect everything. Being on the other side now, gives me a new perspective, but that doesn’t help you except to let you know…I understand. Keep me updated on what happens. Happy birthday!! Wishing you much happiness & many blessings.. this year and all the ones to come as well! Godspeeed! Happy Birthday!!! Hope you enjoyed your cookies! I love spending time on your beautiful blog! Happy birthday!! I hope you had a wonderful day – and may I say, what a great reflection post. The Easter Bunny left a basket of candy and small toys. Then it was off to church followed by a big family dinner.